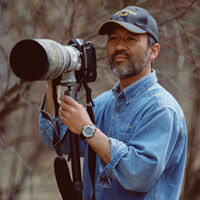 Montana House is pleased to host local photographer/videographer Sumio Harada for another “Look, Listen & Learn” program. Sumio will be the featured speaker on Saturday, May 26, 2018 at 11:00am and 2:00pm at “Kintla Camp” at Montana House in Apgar Village. His presentation will include pictures of the more shy members of the Park ecosystem such as the Red-naped Sapsucker, the Pika from the high country rock and boulder areas, and the White Tailed Ptarmigan – the expert in camouflage. He has new video from the fall of 2017 of Mountain Goats, his favorite subjects and of grizzlies feeding on a moose carcass in Many Glacier while wolf waits for a turn. Reservation required, please call 406-888-5393 to reserve your seat.